In this story, Rags, the klepto cat, saves a beautiful Himalayan when he finds her near death one chilly night. Did this pampered kitty escape or was she abducted? Her wealthy owner, June Balcomb, can only guess. June is so grateful to Rags that she embraces the entire Ivey family, and Savannah and Rags become frequent visitors at the Balcomb estate. It doesn't take Savannah long to realize someone close to June is out to harm her. The plot thickens when those June relies on most come under attack, her grandnephew is kidnapped, her attorney stabbed, and a trusted employee dies. When someone attempts to poison one of her cats, June agrees to bring in a whole new staff - all friends of the Iveys. Against the advice of others, she also hires a young woman who was only recently released from jail. Will things calm down for June once she has sent her staff and relatives away? Not until Detective Craig and Savannah, with a lot of help from Rags, start stirring things up. The Kindle version of Meow for the Money is available now for only $2.99 at Amazon. 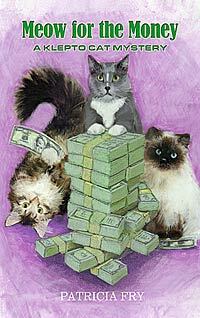 You can also get the print version of Meow for the Money here.